One of the better gardening decisions I've made in recent years was to add a small fish pond to my habitat garden. There's nothing very fancy about this pond. It is just a 4'x6' hole in the ground with a liner. Add water, a few rocks and plants and eight goldfish and there you have it! But it has made a big difference to the wildlife with which I share my garden. As I walked out to the pond one day this week to feed the fish, as I do every day, I was reminded of the difference it has made. As I got close to the pond, two frogs that had been sitting on the rocks that surround the water jumped in. I hadn't seen them before they jumped so I'm not sure what species they were, but it just made me indescribably happy to know that frogs were enjoying my pond along with the fish. Could there possibly be some tadpoles in my future? Last summer, a toad made its home among the rocks around the pond. We became nodding acquaintances because I would see him almost every day as I fed the fish. I wonder if he'll be back this year. Last year, too, there was also a small striped garter snake that I often saw among the rocks. I guess he and the toad coexisted. He wasn't big enough to do the amphibian any harm. I'm hoping I'll see him around again this summer. Less welcome visitors to the pond are the raccoons that sometimes mess with my plants. At least they haven't bothered the fish so far, and I haven't had any visits by kingfishers or egrets after the fish. 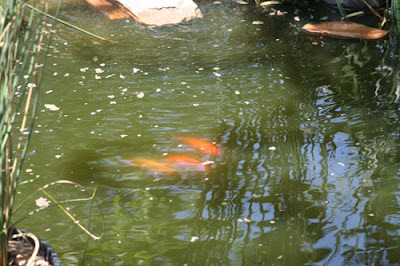 The fish do have hiding places they can swim to if needed. The pond has quite simply become one of my favorite spots in my garden. This past winter, I added a planting bed around three sides of the pond. The fourth side already was bordered by a bed. I've planted 'Texas Star' hibiscus (one white and one red), three 'Monkey Business' yellow floribunda roses, some lemon grass, and strawberries in the bed. Planting the strawberries this week was the final touch. Now I just have to wait and see how the plants perform for me. It's been another very busy week in the garden, with a lot accomplished, but, as we all know, a gardener's work is never done! In the upcoming week, I'm looking forward to the delivery of a rain barrel on Monday, and already I'm planning to add another barrel beside it. Too bad I didn't have the barrel in place during all our rain last week. It would have been full to the brim by now. Did you remember to wear your green today? Well, even if you didn't, gardeners are always the greenest people around! Happy St. Patrick's Day. Ponds do definitely add a different dimension to the landscape, Jayne. Even a small one like mine. Your pond is very beautiful and completely natural looking.....perfect in my eyes. I did not want fish in my pond, but eggs must have come in with some plants because now I have two !!! Natural food for the fish - well, that is Nature, isn't it, Cheryl? But, you're right, I'm sure if we do have tadpoles, some will manage to survive. Would you miond so much if i followed your blog to rerad future articles?